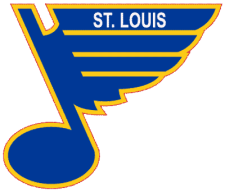 For the type of music, please see St. Louis blues. 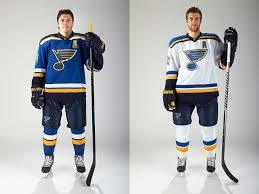 The St. Louis Blues are an ice hockey team in the National Hockey League (NHL). They began in 1967. They have never won the Stanley Cup championship, though they made the finals in each of their first three seasons. The Blues won the President's Trophy as top team in the regular season in the year 2000. The name Blues is a pun (play on words) between the colour blue and Blues music; thus a blue note is the team's logo. There is a song entitled St. Louis Blues. In their first years, they had a good team because of experienced players such as goaltender Glenn Hall. In 1968 Glenn Hall won the Conn Smythe Trophy as most valuable player in the playoffs. But the team did not win in 1968. They had some trouble in the 1970s. In 1980-81 Mike Liut was named best goalie in the NHL. The 1980s were a good decade for the Blues. Mike Liut, Bernie Federko, Doug Gilmour, and Joe Mullen were all important players for the team in the 1980s. The 1990s also were a good decade. Brett Hull led the NHL in goals in 1990, 1991, and 1992, with the help of centre Adam Oates. Hull is the son of Chicago Blackhawks star Bobby Hull. Brett Hull won the Hart Trophy as most valuable player in 1991. Curtis Joseph was a strong goaltender in the 1990s. Al MacInnis (1999) and Chris Pronger (2000) each won the Norris Trophy for best defence; Pronger also won the Hart Trophy in the year 2000. Doug Weight, Pavol Demitra, and Keith Tkachuk were also strong players in the early 21st century. The Blues made the playoffs 25 years in a row from 1979-80 to 2003-04, an NHL record. In 2006 they finished last in the NHL. The Blues have come to be one of the NHL best teams, there advance gameplay has marked them, a team capable of winning The Stanley Cup. 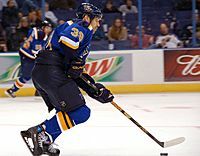 St. Louis blueliner Eric Brewer (#4) was named captain in his third season with the Blues in 2008. David Backes, the captain of the St. Louis Blues from 2011 to 2016. Prior to the 2014-2015 season, the team released new home and away jerseys. These jerseys were strikingly similar to those worn in the early 2000s. St. Louis Blues Facts for Kids. Kiddle Encyclopedia.